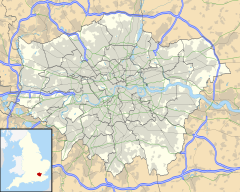 Selhurst is a London suburb in the Borough of Croydon 7.8 miles (12.6 km) south-south-east of Charing Cross. The area is bounded by South Norwood, Croydon and Thornton Heath. The home stadium of Crystal Palace Football Club, called Selhurst Park, is sited at the northern end of the neighbourhood. The BRIT School, a performing arts school operated by The BRIT foundation, more commonly known for the BRIT Awards, is located in the area. Selhurst is named after the Anglo Saxon for "dwelling in a wood". Evidence of a Saxon settlement was found when the railway station was built. The land was once owned by Henry VIII. Heavers Meadow is an open space covering an area of 8.75 acres (0.014 sq mi; 0.035 km2) with a footpath through a flood meadow. The composer Samuel Coleridge-Taylor (1875–1912) lived at 30 Dagnall Park and the writer Sir Arthur Conan Doyle (1859–1930) lived on Tennison Road. White British is the largest ethnic group as of the 2011 census, forming 26% of the population. The second and third largest were Black Caribbean and Black African, both 14% each. Selhurst railway station has frequent trains north to London Victoria, and London Bridge at peak times, and south to Sutton, Caterham and Epsom Downs via East Croydon and West Croydon. There are also hourly train services to London Bridge from West Croydon, and nearby Norwood Junction provides many more services, including the new East London Line. Selhurst Depot is mainly used by the Southern train operating company. London Bus Route 75 and London Bus Route 157 both run the length of Selhurst Road, terminating at Croydon & Lewisham (75) and Morden & Crystal Palace (157). Selhurst is in Zone 4 of the London Transport Network. ^ "Croydon Ward population 2011". Neighbourhood Statistics. Office for National Statistics. Retrieved 10 October 2016.